Why Have Democrats Failed in the State Where They’re Most Likely to Succeed? Massachusetts should be a model state for liberal public policy, but instead it is one of the country’s most unequal. This piece has been adapted from Thomas Frank’s new book, Listen, Liberal: Or What Ever Happened to the Party of the People? (Metropolitan Books). When you press Democrats on their uninspiring deeds—their lousy free-trade deals, for example, or their flaccid response to Wall Street misbehavior—when you press them on any of these things, they automatically reply that this is the best anyone could have done. After all, they had to deal with those awful Republicans, and those awful Republicans wouldn’t let the really good stuff get through. They filibustered in the Senate. They gerrymandered the congressional districts. And besides, change takes a long time. Surely you don’t think the tepid-to-lukewarm things Bill Clinton and Barack Obama have done in Washington really represent the fiery Democratic soul. The coming of post-industrial society has treated this most ancient of American cities extremely well. Massachusetts routinely occupies the number one spot on the State New Economy Index, a measure of how “knowledge-based, globalized, entrepreneurial, IT-driven, and innovation-based” a place happens to be. Boston ranks high on many of Richard Florida’s statistical indices of approbation—in 2003, it was number one on the “creative class index,” number three in innovation and in high tech—and his many books marvel at the city’s concentration of venture capital, its allure to young people, or the time it enticed some firm away from some unenlightened locale in the hinterlands. Boston’s knowledge economy is the best, and it is the oldest. Boston’s metro area encompasses some 85 private colleges and universities, the greatest concentration of higher-ed institutions in the country—probably in the world. The region has all the ancillary advantages to show for this: a highly educated population, an unusually large number of patents, and more Nobel laureates than any other city in the country. Perhaps it makes sense, then, that another category in which Massachusetts ranks highly is inequality. Once the visitor leaves the brainy bustle of Boston, he discovers that this state is filled with wreckage—with former manufacturing towns in which workers watch their way of life draining away, and with cities that are little more than warehouses for people on Medicare. According to one survey, Massachusetts has the eighth-worst rate of income inequality among the states; by another metric it ranks fourth. However you choose to measure the diverging fortunes of the country’s top 10 percent and the rest, Massachusetts always seems to finish among the nation’s most unequal places. Many of the empty factories in which their ancestors worked are still standing, however. Solid 19th-century structures of granite or brick, these huge boxes dominate the city visually—there always seems to be one or two of them in the vista, contrasting painfully with whatever colorful plastic fast-food joint has been slapped up next door. The effect of all this is to remind you with every prospect that this is a place and a way of life from which the politicians have withdrawn their blessing. Like so many other American scenes, this one is the product of decades of deindustrialization, engineered by Republicans and rationalized by Democrats. This is a place where affluence never returns—not because affluence for Fall River is impossible or unimaginable, but because our country’s leaders have blandly accepted a social order that constantly bids down the wages of people like these while bidding up the rewards for innovators, creatives, and professionals. Even the city’s one real hope for new employment opportunities—an Amazon warehouse that is now in the planning stages—will serve to lock in this relationship. If all goes according to plan, and if Amazon sticks to the practices it has pioneered elsewhere, people from Fall River will one day get to do exhausting work with few benefits while being electronically monitored for efficiency, in order to save the affluent customers of nearby Boston a few pennies when they buy books or electronics. 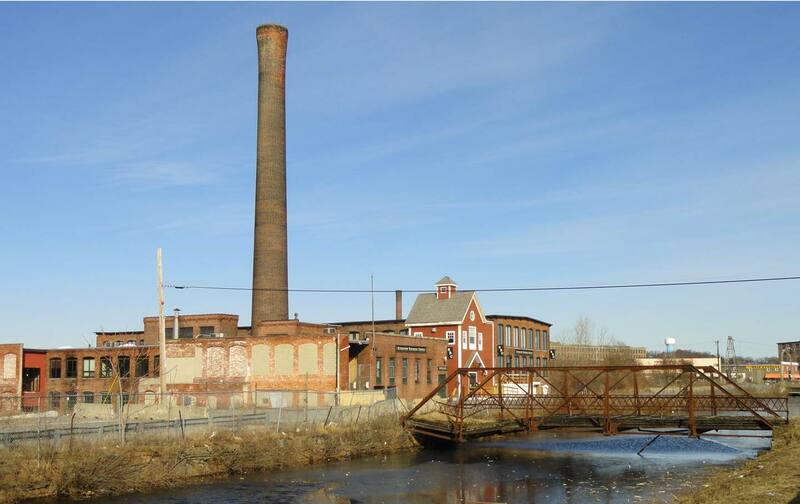 If Fall River is pocked with empty mills, the streets of Boston are dotted with facilities intended to make innovation and entrepreneurship easy and convenient. I was surprised to discover, during the time I spent exploring the city’s political landscape, that Boston boasts a full-blown Innovation District, a disused industrial neighborhood that has actually been zoned creative—a projection of the post-industrial blue-state ideal onto the urban grid itself. The heart of the neighborhood is a building called “District Hall”—“Boston’s New Home for Innovation”—which appeared to me to be a glorified multipurpose room, enclosed in a sharply angular façade, and sharing a roof with a restaurant that offers “inventive cuisine for innovative people.” The Wi-Fi was free, the screens on the walls displayed famous quotations about creativity, and the walls themselves were covered with a high-gloss finish meant to be written on with dry-erase markers; but otherwise it was not much different from an ordinary public library. Aside from not having anything to read, that is. And then there are the innovation Democrats, led by former Governor Deval Patrick, who presided over the Massachusetts government from 2007 to 2015. He is typical of liberal-class leaders; you might even say he is their most successful exemplar. Everyone seems to like him, even his opponents. He is a witty and affable public speaker as well as a man of competence, a highly educated technocrat who is comfortable in corporate surroundings. Thanks to his upbringing in a Chicago housing project, he also understands the plight of the poor, and (perhaps best of all) he is an honest politician in a state accustomed to wide-open corruption. Patrick was also the first black governor of Massachusetts and, in some ways, an ideal Democrat for the era of Barack Obama—who, as it happens, is one of his closest political allies. What did all of this inno-talk mean? Much of the time, it was pure applesauce—standard-issue platitudes to be rolled out every time some pharmaceutical company opened an office building somewhere in the state. On some occasions, Patrick’s favorite buzzword came with a gigantic price tag, like the billion dollars in subsidies and tax breaks that the governor authorized in 2008 to encourage pharmaceutical and biotech companies to do business in Massachusetts. On still other occasions, favoring inno has meant bulldozing the people in its path—for instance, the taxi drivers whose livelihoods are being usurped by ridesharing apps like Uber. When these workers staged a variety of protests in the Boston area, Patrick intervened decisively on the side of the distant software company. Apparently, convenience for the people who ride in taxis was more important than good pay for people who drive those taxis. It probably didn’t hurt that Uber had hired a former Patrick aide as a lobbyist, but the real point was, of course, innovation: Uber was the future, the taxi drivers were the past, and the path for Massachusetts was obvious. A short while later, Patrick became something of an innovator himself. After his time as governor came to an end last year, he won a job as a managing director of Bain Capital, the private equity firm that was founded by his predecessor Mitt Romney—and that had been so powerfully denounced by Democrats during the 2012 election. Patrick spoke about the job like it was just another startup: “It was a happy and timely coincidence I was interested in building a business that Bain was also interested in building,” he told The Wall Street Journal. Romney reportedly phoned him with congratulations. The answer is that I’ve got the wrong liberalism. The kind of liberalism that has dominated Massachusetts for the last few decades isn’t the stuff of Franklin Roosevelt or the United Auto Workers; it’s the Route 128/suburban-professionals variety. (Senator Elizabeth Warren is the great exception to this rule.) Professional-class liberals aren’t really alarmed by oversized rewards for society’s winners. On the contrary, this seems natural to them—because they are society’s winners. The liberalism of professionals just does not extend to matters of inequality; this is the area where soft hearts abruptly turn hard. Innovation liberalism is “a liberalism of the rich,” to use the straightforward phrase of local labor leader Harris Gruman. This doctrine has no patience with the idea that everyone should share in society’s wealth. What Massachusetts liberals pine for, by and large, is a more perfect meritocracy—a system where the essential thing is to ensure that the truly talented get into the right schools and then get to rise through the ranks of society. Unfortunately, however, as the blue-state model makes painfully clear, there is no solidarity in a meritocracy. The ideology of educational achievement conveniently negates any esteem we might feel for the poorly graduated.